Hluhluwe Umfolozi, feeding lions and a rather intangible abstract notion. I told him it was after visiting South Africa, particularly the time I spent in the Hluhluwe Umfolozi Game Reserve. However, Francis’s question stayed in my mind; although I answered him, it left a nagging doubt in my mind I was wrong. After pondering for a few days, the truth unravelled itself. I now knew the correct answer. My interest with Africa and its diverse multitude of wildlife was first stoked by reading the novels of Wilbur Smith. Back in the early seventies, I picked up a rather dog-eared and worn copy of ‘When the Lion Feeds’, which I devoured within two days. I followed that book by purchasing ‘The Dark of the Sun’, again read within a few days. I was about sixteen years old and, for the first time, ‘hooked’ on a particular author. The real answer to the question posed to me by Francis is, it was reading these books when I was a young man that stimulated my imagination, made me think about the heat, the vastness, the veld, the bush and, of course, the animals of Africa. For years, I carried my imaginings of the world Wilbur Smith planted in my head with his words, until one day I had the opportunity to visit Africa myself. The continent is mind-bogglingly vast. The scenery, the smell, the sun, the animals, the people, everything exceeded my expectations, bettered those imaginings I held onto for so long. This I find is something rare, very few places ever exceed our own imaginative conceptions. I have returned to Africa many times, to different areas, different countries within this vast dark continent. You may have heard it said, Africa captures, not only your heart but soul and once you have been, you can never really leave. These are some of the most honest words ever spoken. I am here now, but part of me will forever remain in Africa. Now, being a writer, I cannot leave an article like this with just one conclusion when I know there are always several stories to be told about everything. Therefore, I would like you to also consider this from Wilbur Smiths point of view; or maybe it is just my own interpretation of what I think his view may, or could, be. Who knows? But I’ll write my thoughts out anyway. I wonder if dear old Wilbur thought of me when he wrote his first novel? I don’t mean me as an individual, as a single person but as a conceptual being. I wonder If Wilbur thought he may influence some young man, somewhere in the world, to fall in love with Africa as he typed out his very first paragraph of ‘When the Lion Feeds’ way back in the early 1960’s. (The book was first published in 1964). Then, my thoughts ask the very same question of myself. Do I have an image, a conceptual ‘personage’ in my mind who may, one day, be influenced by my own work, by my writings, by the tiny little black shapes, these strange runes of ink I scattered across countless pages? The answer is yes, I do have such a notion, albeit a rather intangible abstract. Which leaves you to ask yourself the same, do you? Think about it carefully, do you? Just click the cover image. This is a question I asked myself while pottering about in the garden. It may seem like a simple question, one which has a very simple answer; the likes and the things we do listed, almost ‘bullet-pointed’ as a reply. That’s fine, for most people. But I am an author, a writer. To me, even those simple answers have hidden depths, more meaning and a thousand stories each to be told. I know what I do, but I wondered if that was ‘just me’? You see, I love travelling. I love to explore other countries, sampling their food, their culture, being amazed at wonderful vistas, cascading waterfalls, crazy cities, wild traffic and such. I also like to travel around Britain, the place I live. So far, my favourite areas are the Highlands & Western Isles of Scotland. The Llyn peninsular in Wales gets better and better the further west you travel. The very best being Aberdaron and Bardsey Island. I reside in Yorkshire, the county known as ‘Gods Country’ for its stunning landscapes. I originate from the south and was lucky enough to have lived in Kent, called the ‘Garden of England’, which kind of speaks for itself. All in all, I love nature; landscapes, coastal areas, animals, plants, and grand views. I like red wine, cold beer, fine whiskey, food and some good company. To my mind this is what home is all about, making a comfortable place with hints, reminders and touches of all the things you love. Pictures and photographs of loved ones, trinkets and ‘tat’ from all those places you have visited; be it a foreign country or the local park, it’s those little inconsequential, yet sentimental items, like a shell collected from a beach, a pebble from a mountain path or a serviette from ‘that’ café. In a way that is what our homes are for, storing and sharing all those little things which bring back the memories from a life well lived. We can also make our homes reflect the things which make us… us. Especially, at least for me, in the garden, the garden in which I was pottering when I first asked myself the question I am writing about now. In this instance, I have ninety per cent completed a project I started about three weeks ago. In one corner of my garden was a derelict, rotted and neglected raised ‘deck’. I built the deck about ten years or so ago from reclaimed scaffolders boards and, I must admit, was proud of the outcome. The said deck, (holding tables, chairs, potted plants and lighting), hosted many ‘al fresco’ lunches and dinners, served as a ‘buffet’ table during garden parties and barbecues it even became an improvised office for my writing on the days the sun shone and the rains held off. But, as many structures constantly exposed to all weathers, it slowly degenerated, until it was little more than a rickety load of planks balancing precariously on a few rotten cross-members. After laying unused and unloved for so long I decided to rip it up, replacing it with raised-bed vegetable plots and a small seating area. Partly this decision was to do with the ‘stuff’ I wrote about earlier, the travelling to places, the sampling of food and wine and such like. You will see in the following photographs I have placed my potted vines along the wall. These have never produced any edible grapes or enough to make even a single glass of wine, not here in England, not with our weather. But they do grow some large and tender leaves which are perfect for making dolmades, one of those foods I first ‘found’ on my travels many years ago. I have made one deep growing bed and two shallow beds. The idea is to grow ‘root’ vegetables, such as carrots, parsnip, onion and sweeds in the deep one, leaving the shallow beds for the vegetables that grow ‘upwards’; beans, peas, sprouts, lettuce and so forth… once the soil has been delivered, which is about all I need now to complete my task, hence it is only ninety per cent complete. Note the vines and fig tree against the wall. I already have an area for soft fruits and yesterday harvested a bumper crop of particularly sweet and sticky Gooseberries, the ‘Brambles’ (Blackberries) are beginning to set fruits and so still have many flowers. For me it is often gardening, but not simply for gardening’s sake. Its for relaxation, creativity, frugality, satisfaction and for good food, healthy unadulterated food which I and or my wife will turn into some amazing dishes or preserves; some that will bring memories of a time, a trip or a place, flooding back, or maybe excite us, as we look forward to the next travel experience we have planned. These are the sort of things I do when not sitting alone, isolated, eyes glued to the screen and scribbling away like a manic… I’ll let you finish that line! However, I am curious to know what you do when you are not writing, please, let me know so I can be sure it is not ‘Just me’. Don’t forget to visit my website, http://bit.ly/paulswebsite where you can find my latest books, including my Electric Eclectic Novelettes. I am often asked, as I am sure many authors are, “Why do I write?”. This is not a straightforward or easy question to answer comprehensively. In fact, if I were to answer that question in full, it would be an extremely long essay. Which is the answer I gave a few days ago. However, that question was followed by one which made me think, a question I was, at the time, unprepared to answer constructively. This question made me think, beyond the basics of ‘style’ and further than ‘narration’ alone. So, in the regular and rambling way I use in my blog posts, I shall attempt to convey to you my thoughts on this question. I do not write a particular genre of fiction. Romance stories generally demand detailed character descriptions, a slow build-up of intensity to climax. (Excuse the pun). On the other hand, Horror readers want faster paced, less detailed, more action books which cut right to the core. (Sorry, I can’t help myself). By not being a genre writer, I have not developed a style limited by the parameters of reasonable expectation of those readers. Neither do I write for a syndicate publisher, such as Mills & Boon, who have strict plot and style guidelines and can drop any contributor in an instant, should their suggestions not be strictly adhered too. I am a truly free, independent author. I have written an offbeat tale of abduction and intrigue, which is also a romantic story, a tale of finding oneself and humorous yarn all rolled into one. It is ‘The Abduction of Rupert DeVille’. Available on Amazon, just click the link! This book alone breaks all the genre specific boundaries it touches upon. I did not set out to intentionally break any rules, I simply ignored them all and wrote the story I wanted to write. I have also published two collections of poetry. The basic premise of each is human emotion. Fear, love, hate, anger, regret and so on. I like the challenges of poetry. The differing forms, such as haiku, present wonderful opportunities to develop wordsmithing skills that can be adapted to storytelling. That is how I like to think of myself, as a storyteller, a mythmaker; weaving tales into people’s consciousness, making them re-think and to consider life and the world around them in a way they may never have done before. That is what a great story should do. It should stay with you, lingering within your mind a long time after you have closed the final pages of the book, maybe even forever? I have also written a children’s book and non-fiction stuff. Very different disciplines than writing standard adult fiction of any sort. I am, at the time of writing this, working on a novel about an escaped psychopath. ‘Floyd’ is out on a bloody revenge spree against those who had him committed. This book must be considered a ‘Slasher’ type of story. It is a crime thriller certainly, a horror…in parts possibly, but not really. Once again, I am writing what I want to write, in a way I want to write it. The style and narration I am using is unique to this book. It is not one I have adopted previously. Taking note of the above (and remembering my independence), has allowed me to indulge in many experimentations with style, narration, pace, plot, POV’s and all the other ‘literary technical stuff’ writers put far too much emphasis on when discussing writing. Each of my novels are written from a totally different personal perspective. Making each quite distinctive from the last. Even so, my personal mark is to keep an element of humanity, of emotion, of people’s dreams, hopes and fears running through all my fictional stories, even those involved with psychotic killers! My short stories reflect those same values, the human passion for life, the experience of relationships, of desire and love, of living, of loss and of death. I like to explore these areas of the human psyche, areas often forgotten or neglected by other writers and authors. I like to reveal them at a certain pace, a pace which suites the individual story being told. In some I might come at you from the shadows, smashing into your mind like a train wreck. In another it may be an insidious creep, slowly weaving itself between your receptive neurons, until that is the only thing your mind can focus upon. This is where the poetry and experiments with lexicon come to the fore; they allow me to use words as a basic material, melding and moulding them, twisting and forming them, until they convey to the reader, not only the description and facts, but the feeling of being there, of being within, of being part of the nether world where my story lives and, without doubt, to see, hear and feel the trauma, the worries, the excitement and passions of my characters as they stagger from one conflict to another. You can read several my short works at https://alittlemorefiction.wordpress.com/ I always have a few stories on this blog, although I do delete and change them at random intervals. I hope you can pick something useful out of this. I was silently musing, as is my bent, when a certain thought kept returning. No matter how many times I dismissed the notion it would not leave me alone; eventually waking me in the early hours with its persistent nagging. I guess all writers, at least those of us who are serious about our craft, have such occasions? Personally, I find the only way to rid such daemons is to submit to their will, writing about whatever it is which plagues the mind. When I say write, I mean exactly and precisely that. I mean scribble the thoughts down in any way, shape, or form possible. Be it in a note book, a journal, incorporate the idea into your current novel, or do as I am now doing, write it as a blog post. As one writes the thoughts begin to unravel, they start to form strings of coherent meanings and possibilities. Unlike the tangled mass of haphazard notions previously running amok in the brain. As now, many threads appear, each one a possible tale or the premise of another book. This post is but one of those threads, others will follow. I already have a new short story to tell from these very words and shall write a draft as soon as I can, as soon as I finish this. I think of it, each idea, each notion, much like a kettle on the hob. The kettle is full, the gas burning brightly beneath. Slowly, as the water heats it begins to move, agitations growing as the temperature increases, until inevitably, the water comes to a galloping boil. This is the moment the lid starts to rattle, the whistle screams, steam escapes to fill the kitchen and condense on the windowpanes causing rivulets of water to run down and form puddles on the sills. That is how the muse builds up inside of us, the writers and authors. The note pads and keyboards are our lids and whistles. Our editors and proof-readers the rivulets and window panes. It is not until we have wafted away the steam, opened the said windows, letting fresh air circulate, can we finally put everything together and make that nice pot of tea. Of course, that is all a writer’s metaphorical whimsy. But I guess you get my gist? Now I sit at the kitchen table, drinking such tea and reading a book. Possibly your book, the one which you wrote as when your conceptual kettle boiled. Now all I need is a sweet biscuit to dunk…but that really is another story altogether! A simple title, but one containing much truth. How many time have you sat and started to write, or at least tried to scribble out some rudimentary sentences, when your energy is not there? No, this is NOT a post about writer’s block. This is a post about being drained. Being drained mentally, physically, intellectually, when even the most basic concepts evade simple thought. All of which can be emotionally exhausting. I know. I have been there, as I suspect have you. This is the bane, the curse of a writer’s life. This is our penance for shutting ourselves away for hours upon hours, for living our lives with one foot in the fantasy world of fiction, of sharing our days, even our dreams, with fictitious characters, those illusory, invisibles who inhabit our secret worlds, worlds which we never divulge to the others, at least, not until we are certain that they are ready to be revealed. Considering this, it comes as no surprise that stress and anxiety often effect our temperament. We are, after all, artists and creatives. As such, why should our general disposition be any different to that of the most prima-donna of actors, or a highly volatile chef? What is more, unlike the actor or chef, who have a surrounding cast or brigade onto whom they can cast their wrath and vent their spleen, we, the solitary, the secluded and oft isolated writer only have our keyboards and, maybe, a cat or dog. Neither of which deserve to suffer the brunt of our derision. Now, that brings me to where my head is today, to what stimulated me to start writing on this particular topic. Of course I am using that term as a general. What I mean is that I am ‘connected’, my social media is up and running, notifications, messages, hangouts, emails, chat and whatsupps and talktomes and haveyouseens are flashing and popping up every Nano-second, calling out my name, vying for my attention, from just about every social media platform that has been created. Like you, as an author, an independent, self-published writer, I want to sell my books (hint!). Not having millions of pounds in my bank account means I do not have the wherewithal to pay for Saatchi & Saatchi to advertise and market my books. I do not have the distribution power of WH Smiths, Barnes & Nobel, Waterstones or indeed Walmart and Amazon. I am one man, not a corporate host of many. As such my reach and capabilities are somewhat limited to what is physically possible. I have limits I cannot exceed alone. To try and combat this disproportion, my being of David to the conglomerates Goliath, I have spread myself widely over this wonderful, glorious and most obnoxious of modern invention, the internet. I have, often with much reserve, spread myself over the world wide web by way of social media platforms in an attempt to attract at least one person who will purchase at least one of my books, who will read my words, share my fantasy and, hopefully, enjoy that netherworld I created. Perhaps they may even return, buy another one of my books and re-join my journey? Maybe. Yet to get to that point, where someone may actually want to own a copy of your work, a copy of that book you have spent all your spare time writing, for the past two years, means that you have to talk and communicate with thousands. You have to build relationships, acquaintances and associations. You have to make connexions and affiliations, create rapport, bonds and liaisons. For the greater part this works fine. There may be the odd and occasional idiot you come in contact with, but that is no different to the ‘real world’, the meat space that we inhabit in natural form. At rare times you might encounter some who take pleasure in belittling others purely because they derive some sick pleasure from doing so. But you can turn a blind eye to these, block, delete, report and so on. Again this is only a digital interpretation of today’s world. One only has to watch a single new bulletin to make that simple comparison. Yet it is those you choose to communicate with, those you classify as ‘friends’ who can flick that switch and send you plummeting into the deep pit of depression. A simple word, a throw away sentence, a wrongly worded, or indeed wrongly interpreted text, can combine with the isolation, the frustrations and become that final once of pressure that sends you spiralling into darkness, or rage or both. This is where things get bad! Once you are there, at the base of that gloomy depression of despondency, it all becomes a vicious circle of seemingly hopeless misery. Each time you type out a word it is wrong, you have nothing to say, nothing to add, you cannot think of anything to write, nothing at all. The last chapter you wrote is crap, I mean total, pathetic, amateur crap with a capitol ‘c’. What on earth were you thinking about. Best scrap it, delete it…in fact why not delete everything? It’s all crap anyway and you know it. You will never make it as a writer. You are pathetic, your writing is woeful, ridiculous and nobody will ever want to read it anyway, so you are just wasting your time. Now you have ‘writers block’ on top of everything. You sit and stare at the keyboard, the walls, the window. Your head is pounding, not with a headache, not yet anyway, but with frustration. You are trying to think, inspiration, a plot, nothing works, nothings coming. That is what hurts. You can’t even read Facebook. Your eyes wont focus on the screen. Your teeth are clenched. Those words keep flashing in your mind. How dare she say that. What a senseless dickhead he really is. How come so many liked my cartoon of the dog and the Vicar, but all I got for that insight was one like and a truck full of insults and derision. The truth is that YOU are making too much of it all. You have taken your exhaustion and converted it to emotions…not the shrewdest move you could have made. All the mental, physical, creative and intellectual output has drained you. Each and every event surrounding you seems enhanced, seems far greater than it is. You need to rest from writing, let your mind relax a little, slow it down…schuush….rest. We lone writers do not have a gauge to tell us when we are getting low on that energy. We do not have an entourage to bounce our frustrations off. We do not have a colleague to share annoyances or vexations with. But we need to learn how charged we are, we need to know when we have used our stock of vigour and are eating into pure emotion. We need to know when we are running on empty. Please visit my author page and take a look at my books. There is always a tomorrow. It has been over a month since I last posted on this blog. That is not because I have been lazy, or that I have had nothing of interest to share, it is simply that I have a full life and priorities are in constant flux. Take this morning for an instance; I awoke with three tasks on my mind. Three simple little chores that needed attending to. The same three chores I thought of last night when I crawled under the duvet. I have now, at seven o’clock on an evening accomplished all three of those jobs. They are done and dusted. Finished. BUT…and this is the point…I have only just completed the last of those three tasks. You see, life came between the plan I had in mind when I retired last night, the same basic idea which was in my head, as I stumbled from my bed and bounced off the walls on my way to the bathroom, while rubbing the sleepy-man’s dust from my eyes this morning. Other things swam to the top of the quagmire of the ‘urgent’ lake. Like festering bubbles of noxious gasses, they rose swiftly to the surface of ‘to do now’ forcing other tasks and more pleasant jobs back under the surface of crucial undertakings. I am not a list man, not any longer anyways. I now, in my years of semi-retirement, prefer the ‘Mañana’ approach to life. I am a firm believer that ‘Irie’ is a far better way to avoid a heart-attack than a daily dose of aspirin. Therefore, slotting another job into a day, or in fact removing one, causes me no stress or bother. Even the prioritising of these tasks are not really my concern, I allow other people, notably my wife, to dictate the order in which they should be undertaken, if not completed. I am happy to simply bumble along, plodding my way from errand to errand. Those that are concluded are concluded, those that remain undone, or partial are left as such until the next sunrise. This is the way I think it would be best for all of us to live our lives. As I said at the start of this post, I have a fairly full life which means that all things in my world are constantly and consistently changing, which is the one thing which stays the same! It is a way of life I have got used to, I have honed the skill of relaxation so that now it looks like I am working. The truth is the same of work, only of course vice-versa. I consider that to stay de-stressed, calm and collected in this high-speed, terabyte infused, interweb fed technological day and age is a rather rare talent. I have not seen many Rastafarians that look particularly stressed-out if the electricity bill is a day late being settled. The Spanish Lothario, your amante muy joven, will not be rushed from the bedroom to attend a job interview. All those things will happen; they will come again in due course. There is no reason to stress about them right now. Yes, as with my day today, things will alter. Some things will transcend others, they will, for a short period of time, become prominent in your mind, urgent if you wish to use that term. But they are transitional, they are themselves just another ripple in our flux of life. Many of these urgencies, the pressures of time and such restraints, are unworthy of true measure. They are false, fake, self-imposed, self-accepted limits. Take a step back I say. Reassess exactly why it is you are rushing around, why you are stressing out. Consider this…what is the worst thing that could happen if you do not complete that task within the time limit you have set? Think. Is it really important enough for you to become so agitated, for your blood-pressure to soar, for your heart to pump so fast? I think not. Do not allow them, do not allow circumstance to rule your life like that. Live your own life. Chill out a little. If there is no tomorrow, there will be no worries either. Now, my own tasks for this day are done, or can wait until ‘later’. I am going to sit and write some more of my forthcoming novel ‘Floyd’, which I have neglected for too long. It will be nice to get re-acquainted with this psychopathic murderer. I may get one thousand words written tonight, I may get absolutely none down on paper at all. But then I have tomorrow. See you all on the other side, Paul. It’s not just, “In God We Trust”. Here is something that has crossed my mind recently (on several occasions). So much can be read into that single word, can it not? Honestly, how many people do you actually trust? It would be passé for me to ask who you would trust with your life. Firstly, because that could take so many forms; from combat, to saving you choking on a chicken bone and because we trust people with our lives each and every day. When you fly you are trusting the pilot, when you take a cab you are trusting the driver; there are doctors, surgeons, police and such like; so in the grand scheme of things trusting someone with your life is not so alien, in fact it is most common. Who would you lend your last few dollars to? I mean your last dollars; the money you depend on; the money you need to live by. Who would you trust to repay that money on time? Who would you let house sit, or house swap with you? Who would you trust not to pry into your private closets, or rummage through your underwear drawer? To whom would you show your browsing history, or private files, without the fear of being judged? I guess you could count those people on one hand? Maybe I am wrong; maybe you are lucky. Or maybe you have more fingers on your hand than I do! Okay, so trust can be considered on many levels, I agree. But I have a feeling that you may trust someone you have not met, or have never seen, a little less than you might trust your neighbor, or a work colleague, even an acquaintance; you know, one of those people who are almost your friend! Generally, I think I am. Which brings me here, to the point of this rambling. I often ask people, complete and total strangers to trust me every day. I ask many of them for money, in return for promises. Because I offer some services. You see, apart from being a writer and an author, I design books covers, I have an online magazine and a book promotion site. When it comes to designing covers I promise I shall do my best to create an eye-catching cover, one that will attract people to take a look, to ‘pick the book up and investigate’. Initially I only have my word to give. I rely on a person’s trust. The same is true of my magazine. People buy features and advertising, often two or three months in advance. They are trusting me to produce the magazine, to distribute it, to hold up my end of the bargain. On my book promotion website, the trust is, that I will provide information as promised, list books as agreed, market the site and so on. I know I am honest. I know I will do everything within my abilities to ensure I deliver, to keep my promises. Yet many of those who place their trust in me do not know that, not initially, not the first time we make an agreement. Luckily, I have a track record of successfully completing the tasks I undertake. I have lots of happy clients and that, in a strange way, turns the tables. You see, once I have done business with someone, once I have done ‘a good job’, I trust them to return to me. I trust that they shall, at some point in the future ask me to help again. Now that may, at this point, sound like standard business practice. But what makes all this stand-out for me is, that most of what I do is with people who are, in the physical world, (the Meat-Space), strangers. I may belong to the same social media ‘groups’ as they. I may have ‘messaged’ or emailed them many times, over many months or even years. I may know (vaguely) what they look like, at least in the best photograph they have, even if it was taken twenty-years ago! BUT…I have never met them, never heard their voice naturally, or felt their flesh, smelt their scent, seen how they walk, talk and laugh, not in the real world. Yet some I consider to be friends, not the i-space, ethereal electronic type of friend, but Friend with a capitol ‘F’. As, (hopefully! ), they do me. Please, do not deceive yourself by thinking that I am a product of this technological age. I am not. I am far older than that. But I accept it, even somewhat embrace it; although with a certain amount of mistrust and caution as to its future influence and where it may eventually lead us. But a little vigilance is no bad thing. So, here I am, connected tentively to un-met people around the globe, via fiber-optics and satellites, yet conducting business on less than a physical handshake; often simply on a few keystrokes that spell out the word ‘Yes’, or even the lesser ‘OK’. I suggest that is a form of true trust? If it is, then in my world that is not a bad thing. If something that can be isolating, even as divisive as the internet, can bring ‘people who have never met’ (we used to term this as ‘strangers’ when I was a child), together by the bond of trust my fear for the future of mankind is somewhat diminished. All we need now is for those who in power to take note, for those who print ‘In God We Trust’ on our banknotes to realise that, in an ideal world those words would actually read ‘In Us We Trust’. Just a thought that was running through my mind. I first posted this on my other blog, ‘Further Ramblings’ as it is not directly connected to writing, to which this blog is dedicated. That said and after reading these words again it stuck me that most, if not all, who write will understand the the thoughts herin. Therefore, I now post this here. Comments and feedback are, as always, welcome. There is far more to our personal dispositions than the simple ticking of our circadian clock. External influences abound. None more so, in my view than the diurnal effect of the sun and the moon, of light and dark. While they are each autonomous in their distinct natures, each flow seamlessly into and from one another. A unified merging of opposing natural qualities. The respective character of all, felt by our minds as their progress inexorably continues, thus affecting our moods and temperaments at any particular given time. I for one have often been aware of such ethereal properties impacting on my senses. How time slows in the darkness of the early hours, the clock ticks visibly slower, the second hand creeping hesitantly onwards. Late night cafés; unhurried, peaceful; the darkness smothering the world in its cloak of slumber, slowing all movement to a stumble. Bus terminals, sitting, waiting under glowing industrial fluorescence, fighting to hold back the invading night. Time yawns and stretches towards dawn. Early winter mornings, chill air and goosebumps. Sunlight, bright yet devoid of heat. Eyes still encrusted by the Sandman’s nocturnal visit as time begins to rouse itself; a new dawn. The nights as we lay in the arms of a lover, wishing that this time could last forever and dreading the breaking of dawn. These times are factors of circadian variation. All and more, separate yet connected, quotidian, diurnal, circadian. Influenced, induced, impelled. Time is not constant, time is respective, subjective and particular. Time is a substance, a distillate, a quintessence of our moods. Yesterday, during the darkening hours we thought so. Yet as the morning breaks once more, uncertainties arise with the sun. Such are our thoughts, our minds and the subconscious workings of deep cognative processes within ourselves. We are not separate entities of individual consciousness, we are simply cogs; one single gear of many within the greater unity of encompassing life, affected by influences beyond that of our singular understanding. I am, therefore time dictates. This is a story my father used to tell me as a young child. Way back then I had no idea that this story was his version of an Aesop’s fable. I loved listening to him regale it over and again; although I had heard this story many times, it was not until I was about seven that I began to understand how the moral of the tale, or at least the basic message it carried, related to life. My father has now been dead for over thirty five years, yet I still recall his voice when I think of the Wind & the Sun. Moreover I am still learning the true extent of how the simple and basic message this story carries can affect every part of our lives, in work, play, socially, and in our domestic and love life relationships. I will try my best to recount this tale as closely to my father’s recitation as I can recall, because I still prefer his version to that of Aesop! Maybe you would too, if you could hear his voice as clearly I still do. One day the Wind and the Sun were looking down upon the earth when they saw a man walking along a footpath. ‘Look at that man’ said the Wind, ‘I bet I can get his jacket off him quicker than you ’. ‘You think you can?’ answered the Sun. ‘Of course’ the Wind replied ‘because I am strong and powerful’. ‘Go on then’ said the Sun ‘let me see what you can do’. So the Wind began to blow. As the Wind blew the man’s jacket flapped in the breeze. The Wind blew harder, whipping up clouds of dust and blowing the leaves from the trees. The man buttoned his jacket, turned up his collar, lowered his head and continued walking. Displeased with his efforts so far the Wind let a howling gale bellow over the ground. It was so forceful that the man had to fold his arms across his chest to stop his jacket from being blown off. The Wind saw what the man was doing took a huge puff and let loose a tempest. The man clutched his jacket tighter to himself, holding it firm with both hands. Again and again the Wind blew and blew. The harder the Wind blew the tighter the man clung to his Jacket. 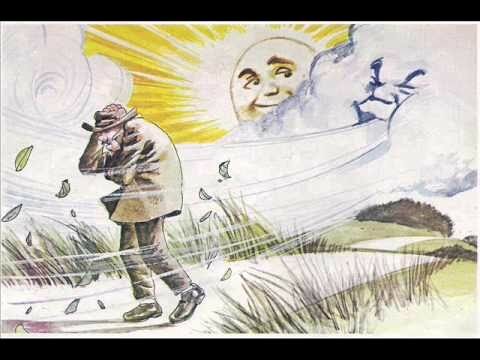 Eventually the Wind had puffed so hard for so long that he blew himself out. The sun laughed and said to the Wind ‘Now it is my turn to try and get this man’s jacket off’. So the Sun smiled and shone his gentle rays of warm sunlight upon the earth and upon the man. The man took his hands from his jacket. The Sun continued to smile and spread his warmth. The man unbuttoned his jacket and loosened his tie. After a while the man, bathed in the glorious heat from the sun, removed his jacket, slung it over his shoulder and began to whistle as he walked. ‘You see, Wind’ said the Sun, ‘you can accomplish far more by being gentle and giving than you can with brute force alone’. I hope you enjoyed my father’s version of this story.